Over time I’ll put up a number of blog posts on the artwork, the process and so on. This page will link to those via tags, direct links and future categories. Here’s a new link to a post I did with photos of the internals from Issue #1 “The Years of Fire” and historical background articles. And here’s another link to a post I did on Issue #2 “Rise of the Revenants”, with photos on internals and original art. Below are some first looks at the pencils and inks that went into Issue #1 of Mörlok. 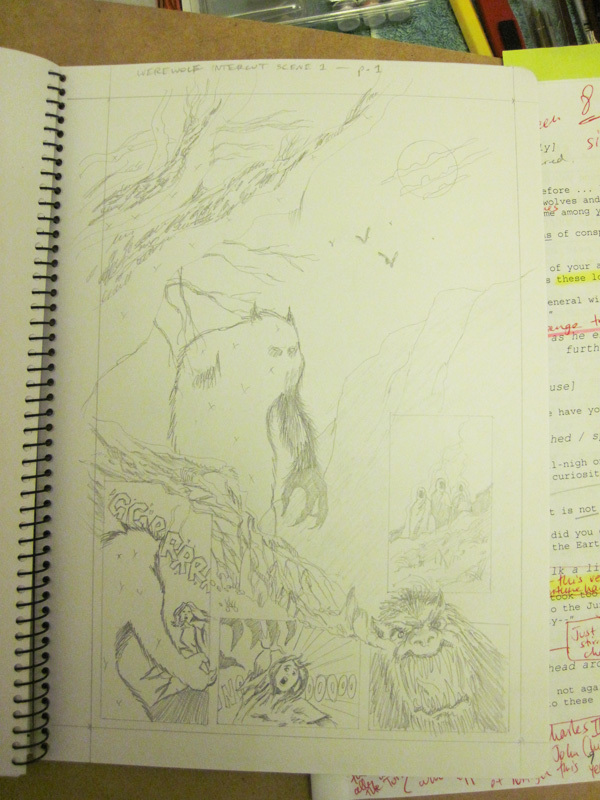 Pencils (before they were inked straight over) for the first werewolf attach scene from Issue #1. I know, I know. Inking on original pencils is a sacrilege. But I was running out of time (the deadline was June 2012 for the Supanova Sydney launch of Mörlok). There wasn’t enough time to go around scanning pencils, converting to faded blue line in Photoshop, printing on a decent stock for inking on the print-out. Though I’m aiming to do this with Issue #2 so I can save the original pencils. Plus it should give me more leeway for experimenting with my inking so I can get a better result. In the process of inking the pencils for a dream sequence recalling the opening scenes where the Wandering Jew is burnt at the stake. I’ll have to elaborate about this one in a future post (and I’ll link to it from here). There were a number of tools and techniques I used, and I’m still trying to find the best combination that works for me and gives satisfactory results (no, I’m not happy with my inking at this stage, and I’m working towards improving that). I use everything from Crow quills with India Ink, brushes (taklon synthetics) with ink washes, to markers, Rotrings, pens (ballpoint), faded markers, CD markers (you’d be surprised at the results of fine-tips), Artline fine-tips and so on. Basically anything that produces a black line. You can read about my fussiness with brushes here, I used both sable brushes (Neef) and taklons for Mörlok, as described – and meticulously take care of them in the same way (hey, you can’t muck around with brushes, either you take care of them or you waste time ruining perfectly good ones). White-out and white acrylics were also used for corrections, but more importantly for highlighting or adding depth. 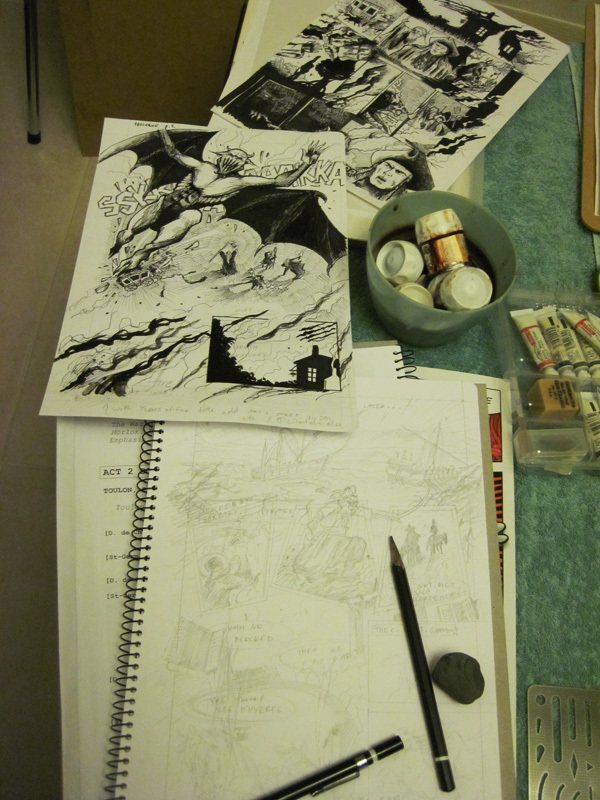 Both pencils and inks, including some of the mediums used (inks, washes and watercolour). The only thing digital about the Mörlok series is the lettering and the titling (including the cover). Everything else is done with pencil, ink and (in the case of the cover) watercolours, acrylics (a little), charcoal (white), acquarelles, coloured pencil and some ink washes. I want to aim to keep it this way throughout the series (though it’s really time-consuming). The cover was done in two layers: pencil (purely) and then the coloured layer. I worked on the highly detailed pencil drawing of the entire scene. Then did a careful and light pencil trace (of just the main shapes) and transferred this to watercolour paper. I then blocked out the main colours and worked them up in watercolour, acquarelles, coloured pencil, a little bit of white charcoal, some acrylics and a few ink washes for depth. The two were then scanned and matched digitally (pencil over the colours) in Photoshop. I’ll aim to add here links to posts and blog categories that cover in more detail (and with more progress photo shots I did at the time). The cover was done traditionally, save for the matching up of the pencils and colours (each artwork was scanned and then laid over one another digitially, then flattened).